bebop spoken here: Southport Jazz Festival - The Train & the River. February 4. Southport Jazz Festival - The Train & the River. February 4. 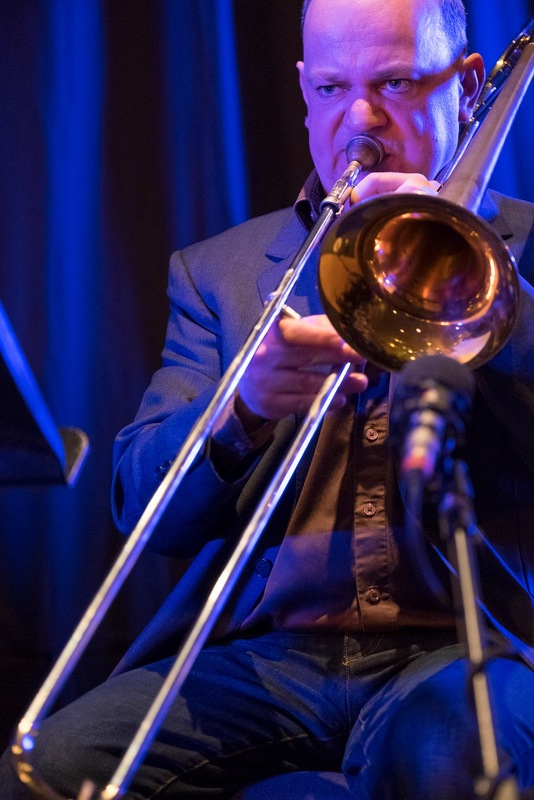 Jeremy Price (trombones), Andy Panayi (reeds), Jez Franks (guitars). Iconic in its own way was how this was introduced. 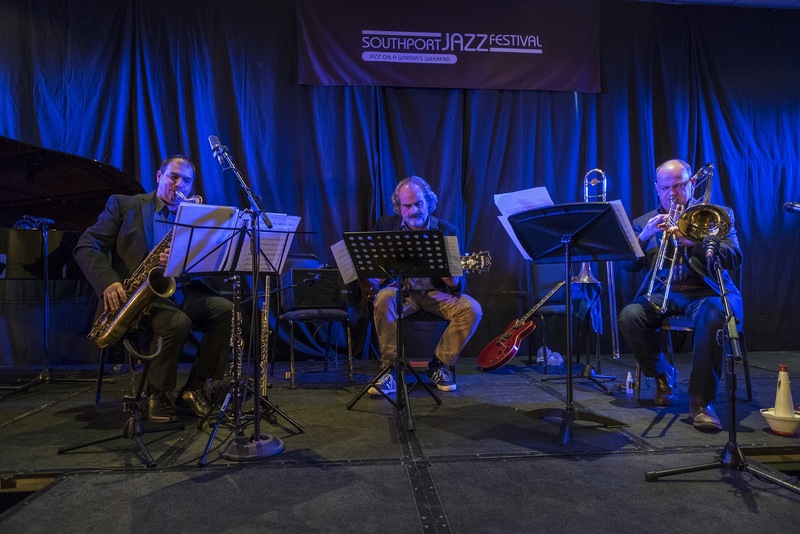 It's based on one of the highlights of the Jazz on a Summer’s Day film which gives the Southport Festival its name, Jazz on a Winter’s Weekend. The Train & the River, by the Jimmy Giuffre Trio (Giuffre, tenor, Bob Brookmeyer, valve trombone, Jim Hall, guitar) one of the outstanding memories of that film and one to treasure. Jeremy Price, on valve and slide trombones, did the introductions. 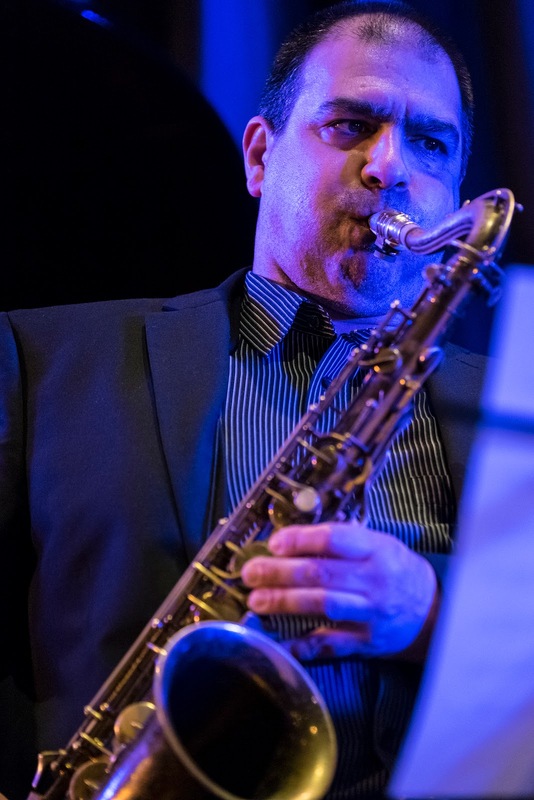 As head of Jazz at the Birmingham Conservatoire, I'd met him before, I'd heard Jez Franks play with Ingrid Jenson at The Black Swan in Newcastle, but a third member of staff from the conservatoire, Andy Panayi was unknown to me and a revelation, bringing an ECM feel early on, and it's no exaggeration to put him with the likes of Andy Sheppard, Gary Burton and Jan Garbarek. After their signature piece we got It Could Happen To You, Price told us, from the category of 'let's see what happens' and unleashed the first Franks’ solo, switching between two Gibsons throughout the set, which the other two had allegedly scheduled to cause him maximum discomfort. 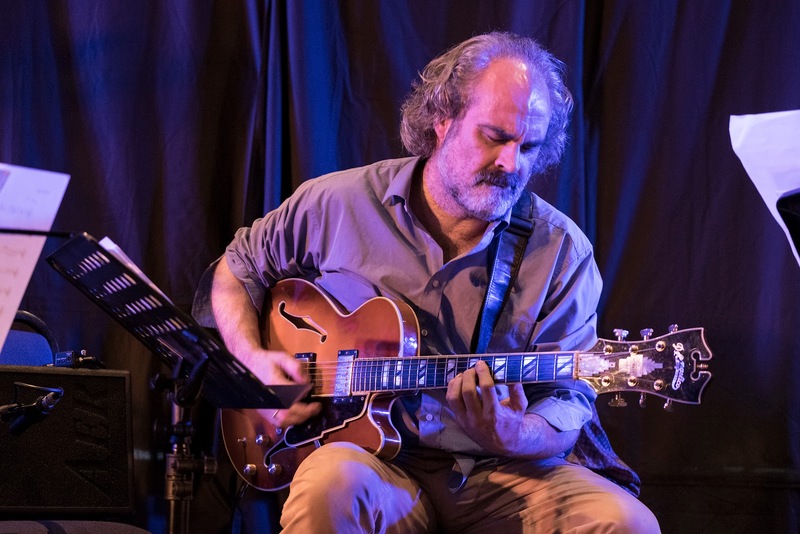 The banter was relaxed and good-humoured throughout, with Jez at one changeover claiming he's like Pat Metheny, a cr^p Pat Metheny. He's certainly like Pat Metheny but definitely not cr^p. Pony Express was followed by Mike Gibbs Tennis Anyone, originally for sextet and this was a huge part of the appeal of this band, recreating something with a seemingly unlikely trio of instruments. We got Think of One from the Brummy Annual Monkathon, where the staff and students trawl through all seventyish Monk compositions, the junior students doing the simpler stuff, the staff taking the middling stuff and the advanced students doing the really tough stuff. A few more empty seats after the break, which wasn't surprising given the nature of the music, but most stayed, which was brilliant. For a nation generally conservative in our choice of music, the rest of us do like something unusual and exotic. The second set opened with Saturday Night Dance, as Jeremy said, to wake everyone up. Apparently , one punter described the first set as sophomoric, which he insisted was a compliment. My One and Only Love, a beautiful ballad, Warm Rocky Place by Saltzman, a bit Spanish, a bit of a sketch, and Pannonica, the second middle name of one of the daughters of Price; should have got a cat. Some flute (yay) and a refreshing change as we're told he's actually a flute player who also plays sax, and it showed. It was just the reinvigoration of the second set needed at just the right moment. More Saltzman with You've Read the Book and more flute (yay). Appropriately they returned to the original source material for the final piece, The Big Pow Wow. It was a brave and bold venture to put this on, the kind of thing you'd struggle to take on tour, but perfect for a slot at a festival, and all credit to the three musicians, all at the top of their game, and the festival organisers. A triumph. If nobody clicks on the Jez Franks photo then they won't find out that particular guitar isn't a Gibson. Must have looked at the same one twice.